The peak of the Lyrid meteor shower will be viewable all over the world this Saturday night. With the best rates seen just before dawn. The Lyrids can offer a shower of activity, with peak meteor rates between 10-100 per hour. This year Dr. Cooke estimates that the rate will be around 15 per hour, though he is hoping for a surprise increase above this! The Lyrids are pieces of debris from the periodic Comet C/1861 G1 Thatcher and have been observed for more than 2,600 years. In mid-April of each year, Earth runs into the stream of debris from the comet, which causes the Lyrid meteor shower. If you’re looking for a fun way to spend an early spring weekend, make plans to stay “up all night” with NASA experts to watch the Lyrids brighten the skies. On Saturday, April 21, from 11 p.m. to 5 a.m. EDT, meteor experts Dr. Bill Cooke, Danielle Moser and Rhiannon Blaauw from NASA’s Marshall Space Flight Center will answer your questions about the Lyrids via a live Web chat. Joining the chat is easy. Simply visit this page a few minutes before 11 p.m. EDT on Saturday, April 21. The chat module will appear at the bottom of this page. After you log in, wait for the chat module to be activated, then ask your questions! 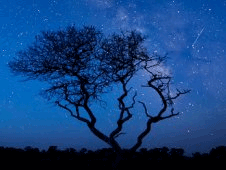 A live video feed of the Lyrid meteor shower will be embedded on the page on the night of the Web chat, and there will be alternate allsky views being streamed from the allsky camera network.